These Yogurt Chocolate Chip Muffins are so moist and high in protein thanks to Greek Yogurt! Perfect to make ahead for breakfast! 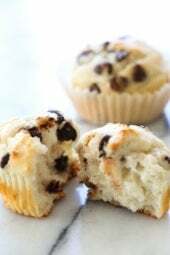 My ricotta cheese chocolate chip muffins have been so popular, they inspired me to try a Greek yogurt version. These Yogurt Chocolate Chip Muffins were such a hit with my daughter Madison! She said they are the BEST muffins she ever tasted! That’s huge considering she’s pretty picky, and perfect as I found a new make-ahead breakfast recipe to add to my rotation. I put the leftovers in the refrigerator after the second day, then popped them in the microwave a few seconds to get the chill out. She’s been eating them all week with no complaints. Preheat oven to 375°F. Line a muffin tin with 12 muffin liners and spray with oil. Mix flour and baking soda with a whisk in a medium bowl. In a large bowl with a hand mixer, mix and cream the butter and sugar on medium setting for about 2 minutes. In a small bowl, beat the egg whites and vanilla with a whisk, add to bowl with butter/sugar mixture. Mix in the yogurt, then flour mixture and mix on low speed until combined, 1 minute. With a spatula, fold in the chocolate chips and spoon to lined muffin tins about 3/4 filled (I used an ice cream scooper). Bake at 375° for until a toothpick inserted in the center comes out clean, about 16 to 18 minutes. Let cool before eating.